We Are Cove Point, Calvert Citizens for a Healthy Community, Beyond Extreme Energy, Sierra Club Southern Maryland Group, Chesapeake Climate Action Network, and Patuxent Friends Quaker Meeting organized the “Walk for Calvert County to be Dominion Free.” The walk was to help residents support each other in the fight against the plant, and to tell Dominion and the local government it is not safe to proceed with a project of this scope so close to 8,045 Lusby residents. Dominion has proceeded with plans to build the LNG plant and export terminal near homes, schools, parks and daycare centers in spite of strong opposition. They are afraid of what may happen if there is an accident when the natural gas facility begins operation. The walk almost didn’t come off as planned when the bus company which had agreed to shuttle walkers cancelled its service agreement with organizers just hours before the event. Tracey Eno believes the company, which also has transport agreements with Dominion, was pressured not to provide the agreed upon service to them. Had Eno not been able to make last-minute alternative arrangements, they would not have been able to finish at Cove Point Park. 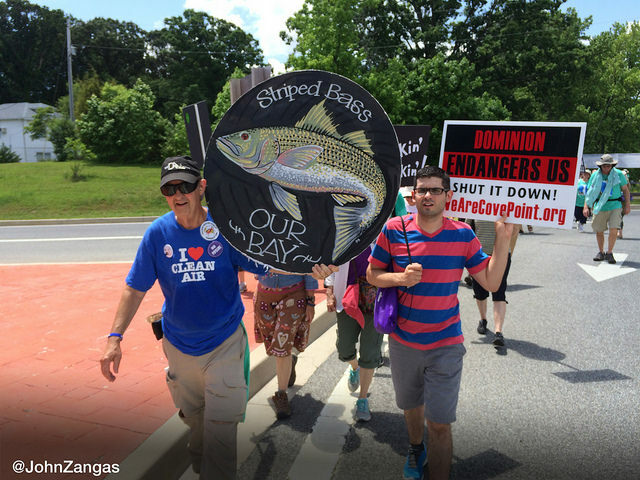 Kathy Strickler, who is retired and lives on a boat with her husband on the Chesapeake Bay, was walking for the environment. “I can’t think of what all these tankers coming in are going to do to the Bay’s serenity and safety,” she said. Walkers followed the route taken by specially designed vehicles with oversize loads from the pier where barges deliver large equipment to the main terminal. On Saturday afternoon, Dominion issued the latest traffic advisory notifying that roads would be closed the following night for one of these oversized hauls. 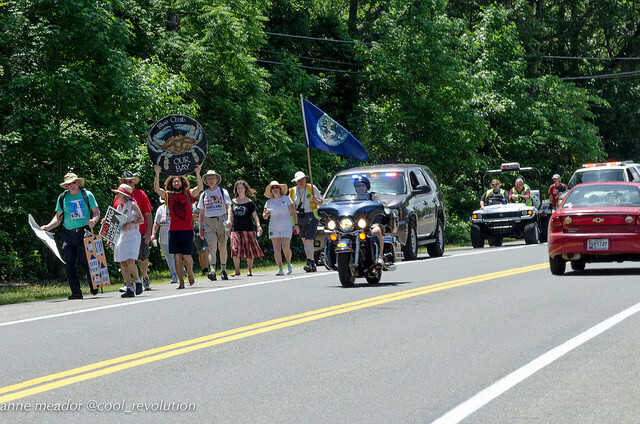 Walkers stopped at the halfway point for refreshments at Patuxent Friends Quaker Meeting House, then continued through the town of Lusby to Cove Point Park. Once they arrived at Cove Point Park, participants were treated to a picnic meal prepared by cooks from “Seeds For Peace,” a mobile kitchen, and entertained with live folk music. Virginia, who grew up in Calvert County, strolled with her 2-year-old son. She is proud of her community. “Many of us are here because of the environment and how much beauty there is surrounding us,” she said.